Ecoloop stand for the new fabric group made with recycled cotton, made in house with post consumer waste and denim scraps. 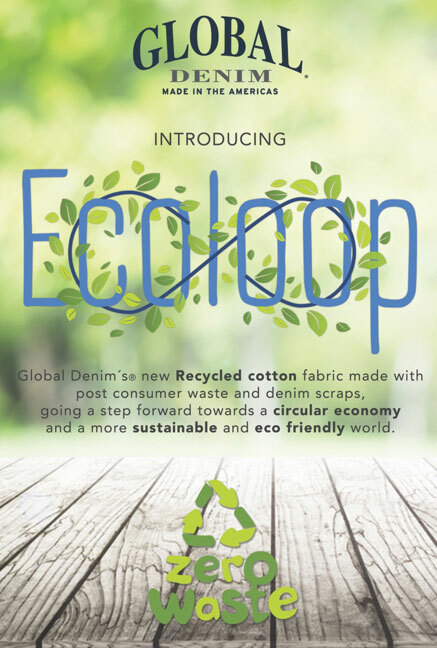 Ecoloop stands for circularity and sustainability. Going a step forward towards a circular economy, a more eco friendly world and a future were consumption can become more sustainable and the reuse of garments and unwanted fabrics, instead of becoming waste, can become a new mine of gold for a new brighter cleaner future. Global Denim will introduce this concept with a test fabric in the next edition of Kingpins in the beautiful city of New York, and plans to expand its collection to be debuted during Kingpins Amsterdam in October. Stay put for more exciting news about this!